VA loan eligibility is more involved than, “You’ve been in the service, you’re all set.” Getting a VA home loan is a big deal — hey, buying a home always is — so you'll have to clear some hurdles. The Department of Veterans Affairs doesn’t issue the loans; banks, mortgage loan companies and brokers do. The VA insures a portion of the loan in case of default. Lenders like that, so they follow the requirements issued by the VA to grant the loans. But lenders also can add some stipulations of their own. That’s why it’s always a good idea to shop more than one. Before you buy a home or condo, build a new house, or refinance or make improvements to an existing one, you'll need to know about these VA loan eligibility and requirements. While a VA mortgage's qualifying requirements are more relaxed than those for a conventional loan, an applicant still needs to have decent credit and sufficient income to buy a home. And the home being financed must serve as the primary residence. Credit score requirements The VA doesn’t set a minimum credit score to qualify for a loan. Instead, it requires a lender “to review the entire loan profile to make a lending decision,” according to the VA. However, each lender you shop will have its own FICO score requirement. VA loan debt-to-income ratio The VA also doesn't specify a maximum debt-to-income ratio. But if the total debt-to-income ratio is over 41%, lenders will need to provide proof of an applicant’s ability to repay the loan, says Greg Nelms, the VA's chief of loan policy. They do this by assessing your “residual income,” accounting for all your monthly living expenses, as well as what your mortgage payment would be. Lender requirements Lenders can add “overlays” — or additional requirements — to VA qualifications. They can range from the number of credit accounts that you have to the number of reported late payments within a specified time frame. Some lenders may require a higher credit score or allow a lower one. That’s why it’s important to apply to more than one lender. Down payment requirements Under most circumstances, you don't need to make a down payment. But if you decide to put some money down, it will likely reduce the VA funding fee. However, if the purchase price of the home is greater than its appraised value — or above the county loan limit (see below) — you may have to make up at least a portion of the difference. If you’re buying in a competitive market where buyers outnumber home sellers, you may need a down payment just to get your foot in the door. A bidding situation will require a deposit for the seller, and as a portion of your down payment, it shows you are a serious buyer. VA loan limits The maximum VA loan guaranty limits the value of a home that can be purchased with no down payment. In 2019, a qualified borrower generally can buy a home with a value of up to $484,350 with no down payment, though the actual amount varies by county. These guidelines mirror the single-family conforming loan limits established by the Federal Housing Finance Agency. Areas with higher-value properties have higher limits — and there are even higher value ceilings for Alaska, Hawaii, Guam and the U.S. Virgin Islands. Property requirements As with other government-insured home loans, the VA has stringent property requirements. Most involve a property’s safety, living conditions and compliance with building codes. Newly built homes must have certain warranties or protection plans or have been built by a veteran for his or her own occupancy, though there are additional exceptions. Modular and manufactured homes must also meet specific requirements. Required fees While a VA-insured home loan carries no mortgage insurance requirement, you will be charged a funding fee. This helps the VA cover the costs of mortgage foreclosures. 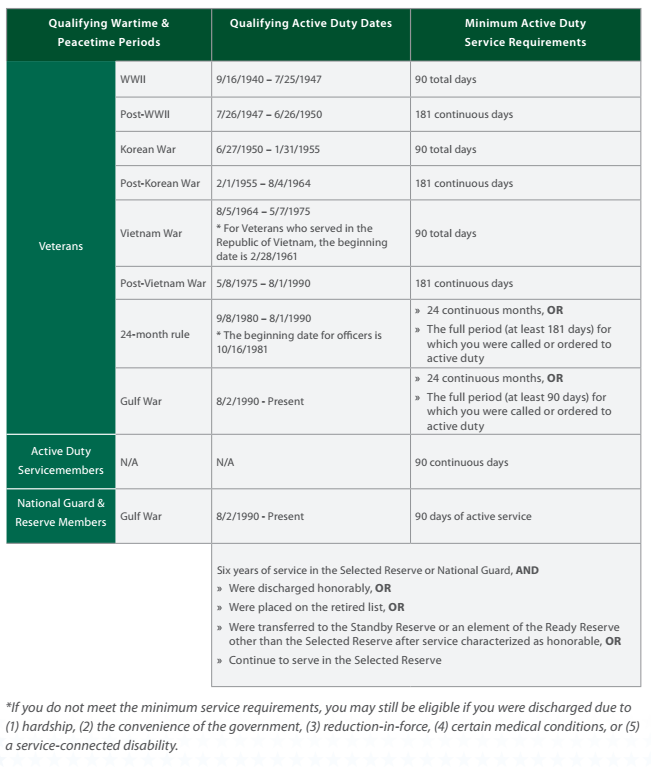 The amount of the fee ranges from 1.25% to 3.3% of the loan amount, depending on the down payment, how long you served and for which branch of the military, and whether you’ve tapped your VA home loan benefit previously. Many times this fee is added to the total loan amount, rather than being paid upfront. That will increase your monthly payment and the amount of interest you’ll pay during the loan term. Veterans who receive VA disability compensation and qualified surviving spouses don’t have to pay the funding fee. You're entitled to apply for a VA mortgage if you're active duty or have separated from military service under an “other than dishonorable discharge,” the VA says. The certificate is most often obtained through a lender, Nelms says, by accessing a web-based system called WebLGY. The U.S. armed forces are a diverse population, and the VA has a couple of programs to meet the housing needs of certain service members and veterans. Special Housing Adaptation Grant This program targets severely disabled veterans and service members. For qualified applicants with mobility issues, blindness, respiratory or other service-connected disabilities, Special Housing Adaptation grants help finance the purchase, construction or renovation of homes to meet their needs. The program helps provide housing that can accommodate wheelchairs, as well as other accessibility improvements. You can apply for a grant by submitting VA Form 26-4555 online or to a regional loan center. Native American Direct Loan Helping Native Americans buy, build, improve or refinance homes on federally recognized trust land is the goal of the Native American Veteran Direct Loan Program. The program is available to Native American tribes, as well as Alaska Native corporations and residents of Pacific Island territories. You'll want to confirm that your native community participates in the NADL program, then ask a lender about potential benefits after you obtain your certificate of eligibility. Borrowers used their VA home loan benefit to fund more than 705,000 loans in 2016. No doubt, little or no down payment, lenient credit qualifications and low mortgage rates were some of the reasons. But no one mortgage product is right for every borrower in every situation. In addition to VA loans, other options are available to qualified borrowers, including loans with little or no down payment required. FHA loans are one example. With down payments as low as 3.5% and the low interest rates that come with government-insured loans, FHA mortgages are worth considering. However, FHA loans require upfront and ongoing mortgage insurance premiums. You can even get a slightly better deal than a non-veteran by using your VA certificate of eligibility when applying for an FHA loan. And for borrowers with good credit, low down payment conventional mortgages are also available. Most likely, your interest rate may be a bit higher, but there’s no VA funding fee, and with enough of a down payment you won’t have to pay mortgage insurance.